Making a digital camera with no rear screen is a pretty dumb idea. Isn't it? Where's the LCD display? You can stop looking because there isn't one. Most devices have some element or other about them that is critical for the way they work or indeed for making them work at all. An engine in a car is an obvious example, as is perhaps a flame for a barbeque, ink for a printer and a door on a refrigerator. If we were to remove that critical element, the function of the device may become so undermined that it would become ineffective at performing the tasks we might reasonably expect of it. Unpredictably unpredictable, Leica Camera has just launched, albeit on a limited, collectable production run of 600 units, a digital camera that does not have something we might all think essential in a digital camera: a rear screen for viewing menus or images captured. The Leica M Edition 60 comes with a Summilux-M 35mm f/1.4 ASPH lens, and comes to us as some sort of Lenten celebration of the 60th birthday of the Leica rangefinder system, at which hair-shirts are compulsory attire. I can't wait to see what they do for the 100th anniversary in 2054 – no imaging sensor perhaps. Of course this isn't the first LCD-free camera, but those that existed before have been left on the hillside to die, as technology has progressed and consumer acceptance of dysfunctional digital products has diminished dramatically. But it is perhaps important to remember that we survived without post-capture review, and on-screen menu systems, for quite a number of years before the digital camera was born. In those days, when we mightn't actually get to see the picture for perhaps a week – or even longer – we would either just point and hope for the best, or spend some time considering what we wanted the picture to look like. Then we'd apply the settings to achieve the look we were after. The term 'pre-visualisation' was almost normal vocabulary for thinking photographers, and often practiced in principle by those who hadn't even heard of it. I wonder if perhaps we'd all benefit from a spell using a camera with no LCD screen. I'm aware that I've missed magic moments myself while being engrossed in the less-than magic moment I caught a second or two before, as it was being displayed in wide-gamut colour on the 3in 912,000-dot LCD on the back of my camera. Perhaps we might all weigh exposure more carefully if we were deprived of the means to check it afterwards. And I wonder how many hours I've wasted reviewing images on the camera's rear screen that I will review again, in more detail and with more purpose, on the computer screen once I got home. As Leica's viewfinders never black out during an exposure we should be able to see exactly what happened at the moment the shutter tripped, so in theory we have no need to check the screen to see if we caught it. It is only DSLRs that leave us in the dark for an instant, while we hope the decisive moment is occurring on the other side of the mirror. When the lens barrel isn't blocking part of the view, Leica M cameras offer the clearest impression of what is being captured. Didn't we manage OK before? The Leica M Edition 60 also only shoots in raw mode, so menu systems for white balance and picture controls – such as contrast, colour tints and dramatic filters – would be somewhat superfluous in any case. When I examined my own shooting practice I probably found that the only controls I use on a regular basis are aperture, exposure compensation and ISO settings. This stainless steel contra-common-sense freak actually caters for each of those in easily accessible form, even if it means reverting to completely manual exposure control. I tend to open the aperture wide, and leave it there, adjusting shutter speeds to suit the occasion. I don't think this method of working is ideal for every type of shoot that I do, but then neither are Leica cameras in general. Technological progress exists for a good reason – to make life more convenient – and in many situations the advantage a rear screen gives us is invaluable for techniques that involve risk and complex set-ups that require trial and error. However, I think having no screen would suit my street photography rather well. I'd have more time to concentrate on what is happening in front of me, as I'd be less distracted by the camera. If I managed when I only had a Nikon FM2 to work with I'd manage again. The discipline I'd be reminded of, when the luxuries of modern devices are stripped away, would benefit my head no end. And I can't think how much better the battery life would be without me fawning over the screen every two minutes. 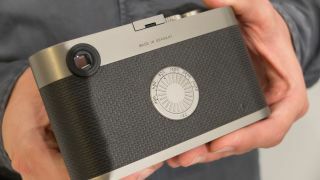 I don't anticipate too many other camera brands following Leica's lead on this front, though many individual engineers might admire the company's philosophy and spirit. I can also say with some certainty that one of these £12,000 cameras is not going to find its way into my possession, this week at least. For now then I might practice the M 60 Way, folding my LCD screen away and trying not to look at it while I'm out shooting. Sometimes we have to glance backwards to see how yesterday's methods can radicalise the way we work today. Why don't we all try it for a day or two? Perhaps it will be an experience we'll be grateful for and we might learn a thing or two. Those crazy Germans from Wetzlar!